Bristol Airport’s passenger numbers rose sharply again last year – up by 6.2% to 8.6m – as it prepares to avoid hitting full capacity within less than three years. Annual traffic through the airport’s terminal is limited to 10m passengers under its current planning permission. Continued growth forecast this year will take passenger numbers above the 9m mark. In December airport bosses submitted a planning application to North Somerset Council seeking permission to increase capacity to handle up to 12m passengers a year by the mid-2020s. The airport, which also has a longer-term vision to develop further to serve up to 20m passengers a year by the mid-2040s, said last year’s increase equated to more than 400,000 additional passengers – nearly 1,100 extra a day. It was the ninth consecutive year of growth for Bristol, England’s third largest regional airport. The airport said growth came from charter and scheduled airlines, with the increase in new its route network during the year taking the number of destinations served direct to 125. Airlines including easyJet and Thomas Cook launched new routes, including to Sofia, Bulgaria, Ostersund in Sweden, Cyprus and Larnaca, while also adding additional capacity on existing routes. Charter operator TUI’s long-haul holiday destinations also added to the growth in passenger numbers while traffic to hub airports such as Amsterdam, Brussels, Dublin, Paris and Frankfurt remained strong as passengers made onward connections to long-haul flights, the airport said. The airport’s proposed development includes new infrastructure, improvements to the existing terminal and road facilities and operational changes to ensure it can continue to meet demand for air travel. Bristol Airport business development director Nigel Scott said: “These figures demonstrate that demand for air travel to and from the South West and South Wales continues to grow, with more passengers than ever selecting to use their local airport. “We recently asked passengers for feedback on why they selected to fly from Bristol Airport – ‘friendly, clean, welcoming, convenient and efficient’ were reasons behind passengers’ choice. The airport, which currently employs around 4,000 on its 196-hectare site, estimates it also supports just under 24,000 jobs in the wider economy of the South West and South Wales. More than £160m has been invested by the airport’s Canadian owners Ontario Teachers’ Pension Plan since 2010 in new facilities and infrastructure to keep pace with growth in passenger numbers. 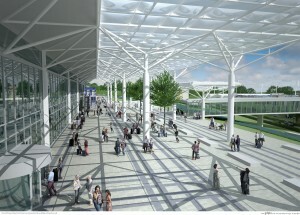 Under the new plans the terminal will be further enlarged, with more space for passenger and baggage facilities and the canopy at the front of the building will be extended over a pedestrianised forecourt, pictured above in a CGI.